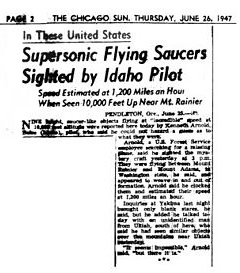 The index case for the modern UFO “epidemic” was the 1947 Kenneth Arnold sighting. If it had been an isolated event it would have dropped off the front pages and out of history, but it was the first of many reported sightings of UFOs in 1947 and throughout the late 1940s and the 1950s. Arnold, a private pilot, was a self-employed businessman who sold fire-suppression equipment throughout the American Northwest. On June 24, 1947, he had installed some equipment in Chehalis, Washington, when he was told that a military transport plane was missing and presumed lost in the Cascade Mountains. On his return flight east from Chehalis across the Cascades he decided to look for the missing plane and changed his flight plan to fly closer to Mount Rainier. As he was making a turn a flash of light caught his eye. He thought it was a reflection from a nearby airplane and looked for it, but he saw only an airliner far away to his left and behind him. A second flash caught his eye. This time he saw it was reflected from a formation of nine bright objects traveling south between Mount Baker, far to his north, and Mount Rainier, closer to the north on his left. They were flying in echelon formation with the lead object highest as they passed over Mount Rainier and flew south ahead of his course. They disappeared over Mount Adams to the south. Knowing the distance between the mountain peaks, he estimated their speed at more than 1,200 miles per hour—faster than the few new jet planes of the era. 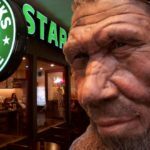 He landed at Yakima, Washington and mentioned the sighting to people he knew at the airport, saying he had no idea what he had seen. 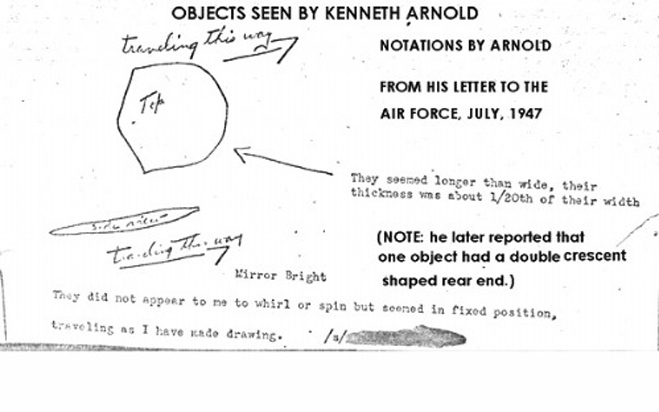 Figure 4 shows Arnold’s drawing of what he saw. 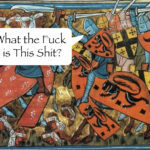 His listeners suggested that he had seen guided missiles. From Yakima Arnold flew on to Pendleton, Oregon, where an air show was about to start. Word of his sighting had preceded him, and when he landed he faced a crowd of interested air show spectators. One person he met there had also seen the same or similar “mystery missiles” on the same day, and the consensus was again that Arnold had seen guided missiles. Arnold talked to a reporter from the East Oregonian newspaper about the objects, but he did not suggest that they were extraterrestrial. He remarked to the reporter that the objects’ flight reminded him of a flat rock bouncing as it skipped across water. The “flying saucer” tag came neither from Arnold nor from the newspaper account, but was created by an anonymous writer who headlined the story circulated by the Associated Press. The Arnold story triggered reports of about twenty similar sightings on June 24th, almost all of them in the Northwest. A prospector who had been working in the Cascades that day said he had watched “round, metallic-looking discs” maneuvering overhead. He counted “five or six” but added that he was looking at one of them through his telescope and may have missed seeing the rest. During the last week of June and all of July so many reports came in that fighters were sent up on “saucer patrol” in the Northwest. An Air National Guard pilot from North Dakota chased a disk but could not catch it. Skeptics, who by and large are reasonable people, and debunk- ers, who are dedicated non-believers with no sense of humor, have been trying to explain away the Arnold sighting ever since it hap- pened. Consider misleading mischief as an explanation. Nothing in Arnold’s life as a businessman and flyer suggests that mischief is the explanation. What would he have to gain? 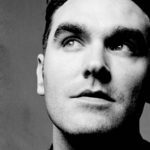 He never claimed that what he saw was extraterrestrial; just that it was unique. 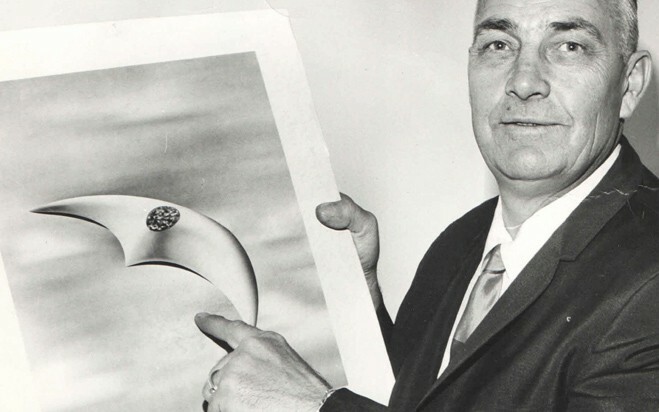 He did become a mild celebrity in the UFO field as a result of his encounter, and he wrote a book and some articles about his experience, but it never became a major part of his life, and he continued his fire-suppression business long after the 1947 sighting. An alternative suggestion is that Arnold may have seen some natural phenomenon. The two phenomena suggested were snow blowing off the mountain peaks and lenticular clouds forming over the mountains. Arnold had been flying around mountains for years, and he would have seen snow blowing off the peaks and lenticular clouds many times before. There is no reason to think that his memory suddenly failed him on June 24, 1947. The debunker Donald Menzel gave three different explanations of Arnold’s sighting in three different books, the last explanation being that he had seen raindrops on his window. Menzel ignored Arnold’s statement that he had lowered his side window to better see the objects. And what about the option first suggested to Arnold: guided missiles? In 1947 no country in the world could fly anything faster than 1,200 miles per hour and maneuver it around a range of mountain peaks. The newspaper accounts about the sightings in the Northwest gave little credence to the possibility of extraterrestrial origin. While the papers acknowledged that the sightings were mysterious, other explanations predominated. Either the UFOs were misperceptions, or hallucinations, or military technology—American or foreign. World War II had been succeeded by the Cold War, which influenced both public and government responses to the new UFOs. 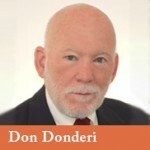 Excerpt from UFOs, ETs, and Alien Abductions: A Scientist Looks at the Evidence by Don Donderi.